Planning and planting a fruit garden. New research by PlantforLife has revealed that there is still a growing rise in the number of gardeners choosing to grow their own food. More than 50% of us are growing our own vegetables and herbs but not quite so many are choosing to grow their own fruit. Growing your own fruit can be extremely rewarding, not least of all in financial terms but, if you want a good crop of fruit next autumn, it takes a certain amount of forward planning and late autumn through to winter is the best time to get you started. 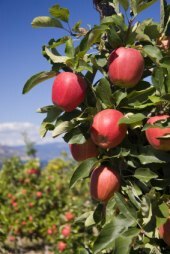 Apple trees are always popular but you can also grow pears, plums, figs, cherries, peaches and nectarines. Plant fruit trees between October and February providing the ground is not heavy with frost. Prepare the soil well with the addition of a good helping of well-rotted manure or home compost. Whether you buy pot grown or bare-rooted trees, make a good sized planting hole, loosen the soil in the bottom of the hole and water the plant well after planting. For bare-rooted trees, make sure the roots are well spread out. Mulch the trees with home compost after planting and every winter thereafter. Most fruit trees will benefit from a sunny spot. If you haven't got a lot of space, you can train them against a wall and prune as cordons or espaliers. When you buy your fruit trees, check whether or not they are self-pollinating. If not, you will have to buy a companion tree to pollinate the fruit. Check the label for the best companion varieties for your chosen tree. 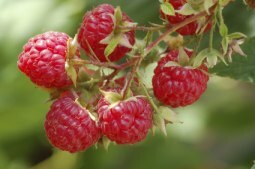 Raspberries, blackberries, red currants, black currants, white currants, gooseberries, loganberries and quince can all be planted between October and February. As when preparing the ground for fruit trees, dig the soil over well before planting and add some well-rotted manure or home compost. Once again, a sunny spot is preferred. For most soft fruits, you may have to wait until year two before you get a decent crop but you may get something in year one. Strawberries should be planted in July. The best way to get started with your strawberry patch is to beg some runners (young plants attached to the mother plant) from a friend or neighbour or buy young plants from your local garden centre. You can grow strawberries in dedicated beds, in containers and even in hanging baskets. PlantforLife aims to help you get the most from your garden with gardening advice, information and inspirational ideas. Find out more at the PlantforLife website.